Fitrite is the ultimate decking and fencing company in the market place, delivering the very best products, solutions and designs for the home improvement sector. Universal in its applications, Fitrite's decking and fencing range is sure to add value to any property including caravans, park & holiday homes, not to mention private residential properties across the board and adding a touch of class to conservatories. Specialising in low maintenance decking and fencing, Fitrite delivers a system that is durable, and extremely safe and non-slip. And with no need to paint or stain Fitrite makes the perfect addition to any garden or patio area. In fact quality is assured with each and every veranda coming with a 20 year warranty that have been fitted by one of our approved installers. Traditional through to contemporary styles, the Fitrite spectrum caters for all tastes and is leading the industry by continually developing its product range to cater for the ever-growing consumer demands. Get in touch with us today and book a site visit! Need a new deck? Let's build it! 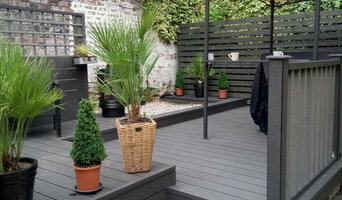 Ecoscape UK is a specialist provider of high-performance composite decking, cladding, fencing and balustrade. The Clarity and Forma composites are inspired by nature for modern individuals looking to spend their free time enjoying outdoor living spaces, not maintaining them! Why Choose Ecoscape UK Composites? Ecoscape UK® offers a wide range of FSC® Certified extrusion and Co-extrusion (capped) composite products in the form of durable, attractive and reliable decking, cladding and other outdoor accessories. Each composite board is extruded using reclaimed timber, recycled HDPE and environmentally stable bonding agents and dyes to create a high-quality product that can easily replicate the characteristics of timber decking and cladding without any of the drawbacks like rotting, warping, or fading. The use of recycled materials helps aid in the battle to reduce not only landfill but the severity of our carbon footprint to FSC® requirements. Our composites are purposefully designed for beautiful, flawless aesthetics but also to meet the dramatic British outdoor conditions such as constant rain and fluctuations in temperature. Both the decking and cladding have low maintenance surfaces which resist the growing algae, mildew or moss. This prevents slipping on the decking, even in wet conditions to British Standard 7976-2:2002 . We have 12 colours across two ranges all with a number of different finishes and can be laid to suit any style whether it be traditional or contemporary. All boards are installed using specialist spacing clips that allow for any expansion and contraction preventing any warping or twisting. These clips also make installation quicker and easier than timber decking and cladding as there is no pre-drilling or special tools required. With an array of benefits, Ecoscape composites eliminate the drawback of 100% timber and PVC products whilst bringing many additional benefits; LOW MAINTENANCE SPLINTER FREE, NATURAL LOOK & FEEL ANTI SLIP SURFACE UV, SCRATCH, STAIN & ROT RESISTANT EASY TO USE HIDDEN FIXING SYSTEM WIDE RANGE OF BALUSTRADE OPTIONS DUAL SIDED BOARDS WIDE RANGE OF COLOURS 95% RECYCLED MATERIALS 20 YEARS + WARRANTY For more information please contact us today on 0845 9011 988 or email our team at sales@ecoscapeuk.co.uk. Brownsons design and installation are a family run business based in Bury. 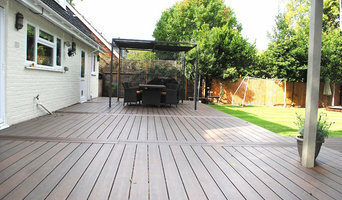 We specialise in all aspects of Decking from timber to composite. We go that extra mile with our great knowledge of bespoke work to create the perfect space to relax or socialise in. With bespoke tailored structures such as VERANDAS, PERGOLAS, GARDEN ROOMS AND BARS, we tick all the boxes. SO venture into the outdoors in style with Brownsons, and enjoy your garden or property. Deckz is eco friendly decking that improves on the products already in existence. Made to two different lengths, our decking and cladding is designed for minimal waste and easy installation. And while standard decking and cladding has a film-wrapped veneer, Deckz products are 100% composite. Elite Outdoor Living designs, manufactures and installs stunning outdoor living solutions with an innovative and low maintenance composite decking and glass railing systems, garden balustrades, glass balconies, juliet balconies, qwickbuild aluminium decking sub-structure. Our goal is to improve the quality of life of the people we meet by reducing the maintenance cost of their gardens close to zero. Fitrite Direct is part of Sash UK Group, one of the UK’s leading manufacturers of timber-alternative home improvement products with over 50 years of product development and manufacturing experience. 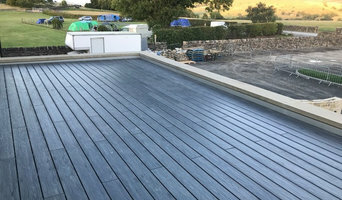 Leon Atkins has been designing and installing quality decking projects throughout the UK and Europe for over 20 years and provides a completely bespoke service. Our experience with both timber and composite decking enables us to produce stunning and practical decking solutions. One of the UK's largest producers and developers of Wood Plastic Compsoite Products including Decking, Fencing, Claddings and outdoor products. Using Recycled end of life Plastics as well as FSC Certified Timber. Ecoteak is a company with years of experience in outside decor and exterior house essentials - garden decks, facades, balconies etc. As the name of our company implies, we specialise in ecological wood compounds which are the best solution for exterior design. Tiger Sheds manufacture and supply the highest quality garden sheds and garden buildings to the UK. Our Garden buildings include Log Cabins, Summer Houses, Wooden Playhouses, Garden Storage Sheds, Metal Sheds, Pet Houses and Bike Sheds. From large sheds to small sheds we're able to offer a wide range of sizes for the majority of our products. We also manufacture the world's first Zombie Fortification Cabin and Spider Proof Shed. Buy Sheds direct from your Local Manufacturer Renowned for Quality, Service and Price. Local business with over 25 years experience in sheds. The Original Jons Sheds Direct. No Hidden Extras, Free Installation & Free Delivery! All our timber is TANALISED (Pressure Treated) which give a 15 year guarantee against anti-fungi and anti-rot. Our timber is RED WOOD which is sourced from Scandinavia and has a much tighter grain, greater density, more natural oils and less knots. We also only use timber that is tongue & groove interlocking to ensure strength and solidity. We are specialists in Trex Transcend composite decking. 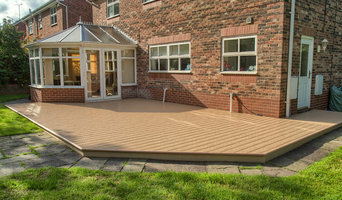 Our decking display can be viewed at Shackletons Garden Centre, BB7 4JY. We are the only company in the UK to be awarded " Trex Pro Gold " status. Extensive portfolio of happy clients. Our YouTube channel has over a dozen of our videos available to view. We were the first company in the UK to fit a Trex deck using the " Custom Curve " forming oven. Some contractors in New Mills, Derbyshire, UK can custom design and build any type of outdoor structure, from decking to pool houses, while others specialise in a certain area. A deck, patio and outdoor structures contractor will typically survey your space and come up with a design that complements your backyard and the exterior of your New Mills, Derbyshire, UK house. 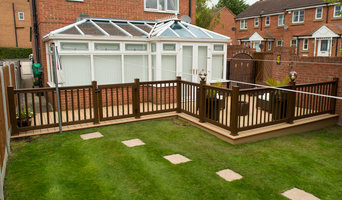 Find a New Mills, Derbyshire, UK deck, patio and outdoor structure pro on Houzz. Scroll through this page to professionals in your area that can design, build and supply materials for all types of outdoor structures. You can browse their latest projects, read reviews to see how other homeowners rate their work, and message them directly.